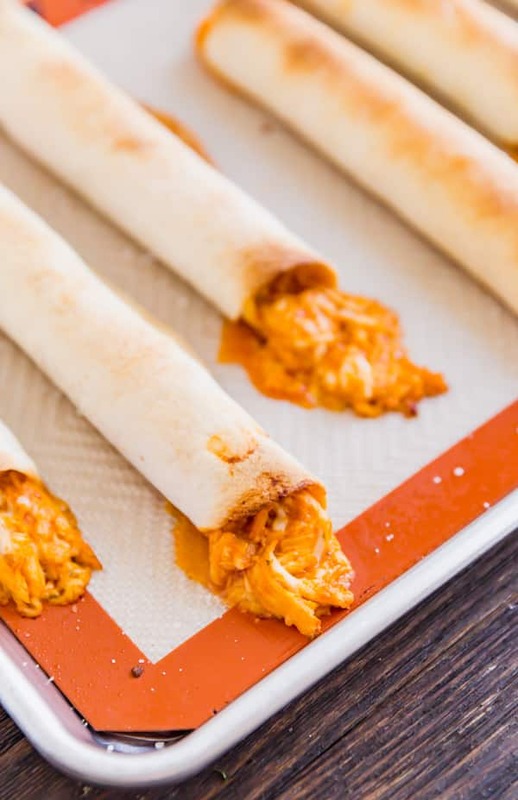 Meet your new favorite appetizer: Baked Buffalo Chicken Taquitos. 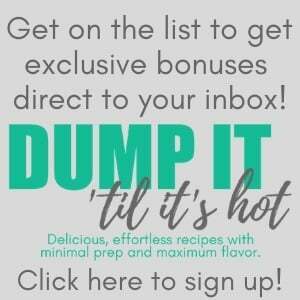 A quick and delicious way to become the most popular person at the party! Is it even possible not to like Buffalo chicken? I’m not quite sure. Even if it doesn’t include chicken, foods drenched in buffalo sauce are everywhere. And I totally get it, what’s not to like? 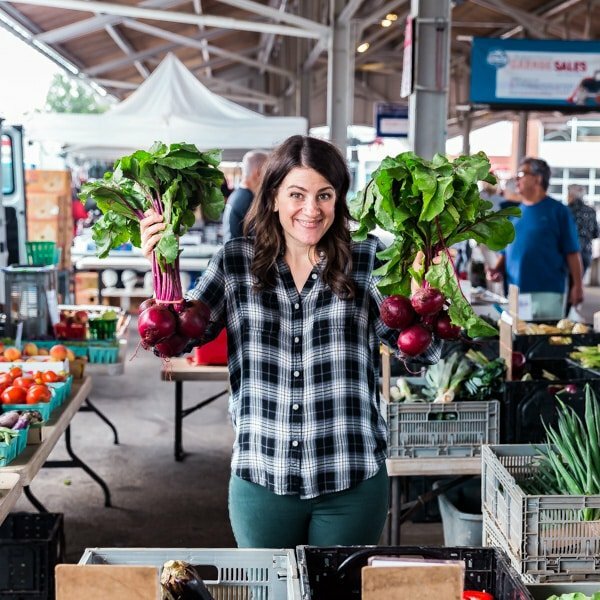 It’s spicy, savory and super addictive! 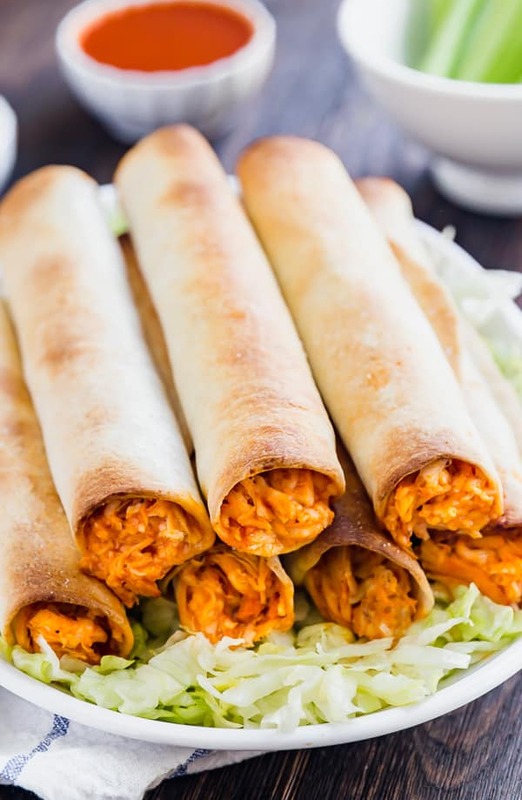 And since buffalo wing dip and since buffalo chicken and chicken taquitos are two of my favorite snacks, I thought “Why not combine them?” Boy was that a good idea! 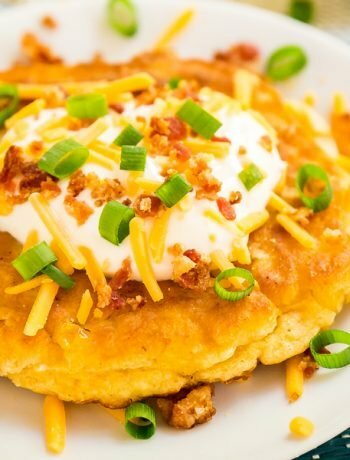 There are crazy delicious and seriously easy to make! I sent the leftover into my husband’s office and they sent back the empty container demanding a refill! 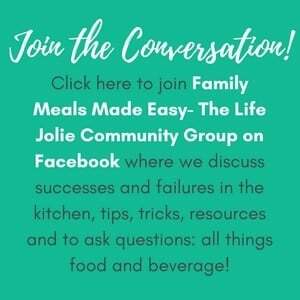 What is the best way to cook the chicken for this? Leftovers from last night’s dinner work great. If you’re short on time, a rotisserie chicken is also a great little hack. But my favorite way to make shredded chicken is in the slow cooker. What if I wanted them to be really spicy? 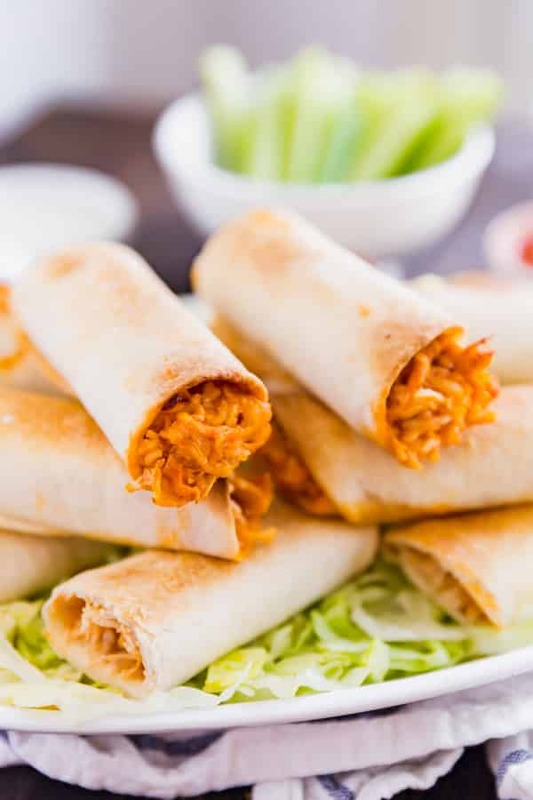 You can easily make these more (or less) spicy by managing the amount of buffalo sauce you add to the chicken mixture accordingly. 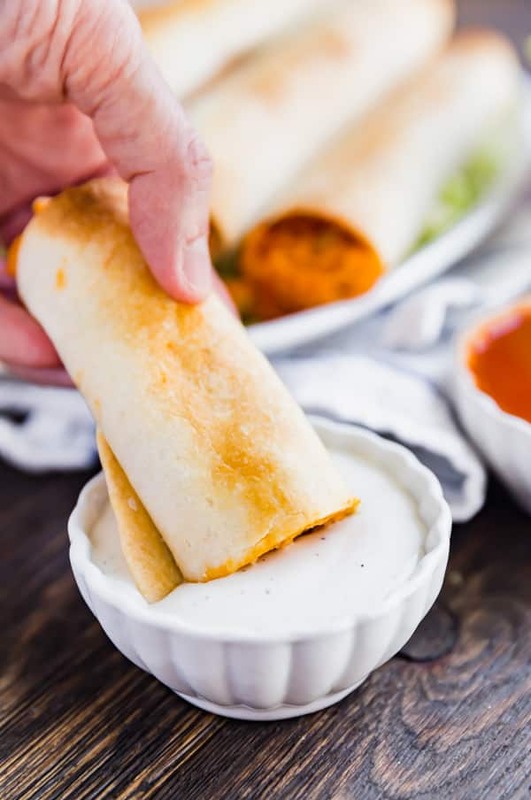 If you’re cooking for a mixed crowd, you might consider taking it easy on the buffalo sauce and then serving some extra on the side so that your spicy-loving guests can dip them into it. 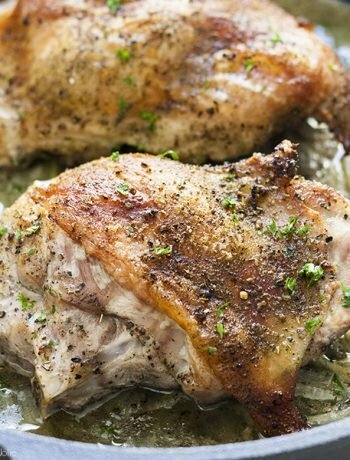 Can I use cooked chicken that I’ve previously frozen in this recipe? Totally! Just make sure you thaw them safely (in the refrigerator or submerged in a bowl of cold water that you change every 30 minutes) and if you do this, don’t refreeze them once assembled. Preheat the oven to 425 degrees and grease or line a sheet pan. In a large bowl mix the chicken, ranch seasoning, buffalo wing sauce and mozzarella cheese until well combined. 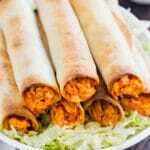 Place 4 Tablespoons of the chicken mixture into each tortilla and roll it tightly. Place each Taquito on the baking sheet, seam side down. Spray the Taquitos lightly with cooking spray and sprinkle with a large pinch of kosher salt. Cut in half and serve immediately with Ranch dressing, additional Buffalo wing sauce and celery. 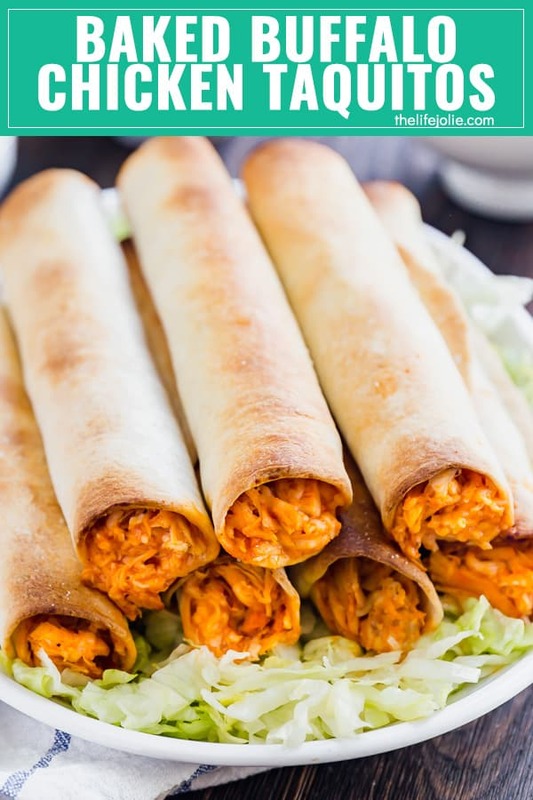 Looking for some other buffalo chicken recipes?